to what I want to be the truth for me. The old apple tree at the side of the house is wearing her springtime gown. Yesterday's tight pink buds blossomed into white delicate flowers. 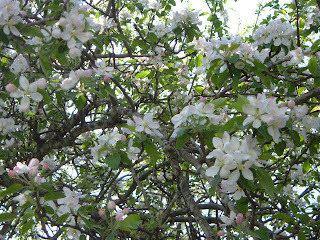 The feminine face in the tree I wrote about last fall is now hidden by her fragrant branches. This morning I sat under the tree, basking in her beauty. Above me, I watched the bees busy at work. And I wondered when I had overcome my fear of them? Tending to the sweet nectar, they didn't notice me. I could see how this beautiful tree was so giving by just being what she is, a fruit tree. Letting things be as they are. Nature is so amazing. Without the flowers, there would be no bees. Without the bees, there would be no fruit. We are all part of this grand scheme of Life. Wonder why we humans often have such a hard time just being who we really are? Sharing our gifts freely without fear of judgment.